Dr. Sharona Ross and Dr. Alexander Rosemurgy are the only physicians in the U.S. to provide safe and more cost effective alternative to gallbladder removal surgery, the most common surgery performed in the U.S. Many people avoid surgery because they have fears related to general anesthesia… with this new operative technique it gives people a more appealing approach. Florida Hospital Tampa is leading the way with the safest and most advanced surgical techniques available today. Advanced Laparoscopic and Robotic Hepatopancreaticobiliary and Foregut Surgeons,Dr. 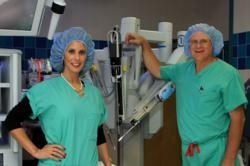 Sharona Ross and Dr. Alexander Rosemurgy have performed more than 100 LESS cholecystectomy surgeries with an epidural. LESS surgery promotes the application of epidural anesthesia, avoiding the costs and adverse effects of general anesthesia. “Epidural anesthesia appears to be a preferable alternative to general anesthesia for patients undergoing LESS cholecystectomy. Many people avoid surgery because they have fears related to general anesthesia… with this new operative technique it gives people a more appealing approach,” said Dr. Ross. Cholecystectomy is the surgical removal of the gallbladder. It’s the most common method for treating symptomatic gallstones. LESS surgery offers patients a “scarless” alternative to traditional multi-incision laparoscopy for an expanding list of procedures, including cholecystectomy. It involves a single incision in the belly button which lends itself to using epidural anesthesia during the procedure. During a research study conducted from June 2010 to July 2011, patients were randomly assigned to have LESS cholecystectomy surgery. Twenty patients were enrolled in the study and were randomized to receive either epidural or general anesthesia during the procedure. There were no significant differences between the groups with regard to age, gender, or BMI. The primary goal was to assess the safety of undertaking LESS cholecystectomy procedures under epidural anesthesia as measured by intraoperative and post events. “Our study concluded that thoracic epidural anesthesia for LESS cholecystectomy provided better pain control in the immediate postoperative period and postoperative day one compared to general anesthesia. Thoracic epidurals block pathways and have been reported to elicit a minimal stress response compared to general anesthesia which may also contribute to lower postoperative pain” said Dr. Rosemurgy. General anesthesia can be associated with many post-operative complications including nausea, vomiting, sore throat, muscle tenderness and other detrimental physiological changes. Using an epidural anesthesia allows patients to stay awake during their operation without feeling the procedure; they can listen to music, talk to their surgeon, watch their operation, or sleep through it. This option offers patients a safe and comfortable alternative to general anesthesia. The majority of laparoscopic cholecystectomies in the United States are undertaken with the conventional multi-incision laparoscopic approach (four incisions) and under general anesthesia with tracheal intubation to avoid aspiration and respiratory complications. Dr. Ross and Dr. Rosemurgy have performed more than 500 of these types of LESS cholecystectomies. “While we believe in providing our patients with the highest level of medical care using minimally invasive no-scar techniques, open communication with patient and family involvement is at the core of our practice philosophy,” added Dr. Ross who was one of the first surgeons in the United States to undertake LESS surgery. By using minimally invasive and single-site laparoscopic techniques for digestive disorders and pancreatic cancer, the Advanced Laparoscopic Team increases surgical options for patients while improving patient outcomes. After completing his residency in Surgery at the University of Chicago, Dr. Rosemurgy joined the faculty of the University of South Florida (USF) in 1984. From 1995 through 2011, he was a Professor of Surgery and a Professor of Medicine at USF where he was awarded The Vivian Clark Reeves/Joy McCann Culverhouse Endowed Chair in Pancreatic Cancer and Digestive Disorders. In addition, Dr. Rosemurgy served as the Associate Dean for Academic Enrichment and Simulation at the university through 2011. Prior to relocating to Florida Hospital Tampa, Dr. Rosemurgy served as Chief of General Surgery at Tampa General Hospital for over 20 years. Currently, he is serving as the President of the Southeastern Surgical Congress. Dr. Rosemurgy has been the lead investigator in over 40 pancreatic cancer trials and has published more than 300 clinical and scientific journals. Dr. Ross received her medical degree from George Washington University School of Medicine and Health Sciences. After completing her General Surgery residency with the Department of Surgery at USF, she was awarded the prestigious Advanced Gastrointestinal Surgery, Hepatopancreaticobiliary (HPB), and Minimally Invasive Surgery (MIS) Fellowship at USF and Tampa General Hospital. Subsequently, Dr. Ross completed a Gastroenterology Fellowship at USF’s College of Medicine. Prior to relocating to Florida Hospital Tampa, Dr. Ross was the Director of Minimally Invasive Surgery and the Director of Surgical Endoscopy in the Department of Surgery at USF’s College of Medicine. She was the Founder and Director of USF’s Women in Surgery Initiative and is the Program Director/Chair of the Annual International Women in Surgery Career Symposium, now entering its fourth year. Florida Hospital Tampa is a not-for-profit 475-bed tertiary hospital specializing in cardiovascular medicine, neuroscience, orthopaedics, women’s services, pediatrics, oncology, endocrinology, bariatrics, wound healing, sleep medicine and general surgery including minimally invasive and robotic-assisted procedures. Also located at Florida Hospital Tampa is the renowned Florida Hospital Pepin Heart Institute, a recognized leader in cardiovascular disease prevention, diagnosis, treatment and leading-edge research. Part of the Adventist Health System, Florida Hospital is a leading health network comprised of 22 hospitals throughout the state.